Veeranarayana Pandurangi hails from Pandurangi family that has contributed highly to the development of philosophies of Dvaitavedanta and Nyaya for the last five hundred years. Born in the year 1973 in Vijapur, Karnataka, Veeranarayana Pandurangi studied at Poornaprajna Vidyapeetha obtaining Vidvat degrees in Navyanyaya and Dvaitavedanta and MA from Karnataka State Open University, Mysore. He has Ph.D. in Dvaitavedanta from Rashtriya Samskrit Sansthan, New Delhi and Ph.D. in Nyaya from Rashtriya Samskrit Vidyapeeth, Tirupati. He worked as researcher in French Institute of Pondicherry between 1999-2005, Acharya, Rashtriya Samskrit Vidyapeeth, Tirupati, and Associate Professor in Department of Darshanas, JR Rajasthan Samskrit University, Jaipur where he was the head of the department and dean of Darshan Faculty. His research interests are in the fields of Indian Logic, Dvaitavedanta, Purvamimamsa, Ancient Indian History, Machine translation where he has contributed by publishing many books and papers in various journals. 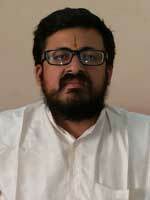 He founded of Bharatiya vidvat parishat with Shrinivas Varakhedi in 2009. He received Badarayana Vyas Samman from President of India in 2011.